Today is my nieces birthday party. They are turning 9 and 10. I wasn't quite sure what to make a 9 and 10 year old since I'm not "cool like that" so I went to Target' and hunted around for something fun. My sister in law told me they liked gum. They spend their allowance on it, chew it all of the time and blow their big ol' bubbles. Easy enough. Bought them a big 3 pack of BUBBLICIOUS each. Yep, the most sugary gum I could find. Remember when you were young and sticking it in your mouth, almost gagging because the pieces are so gargantuan? In school, it was also a test of your friendship if you asked someone for gum and they gave it to you (or not). Usually, when you'd ask, they'd direct you to someone else, till you pretty much asked your whole class and then finally realized that someone had misled you along the way. Sniffle. Oh the memories. Moving on... I found the Hello Kitty section. So much fun stuff... Nail polish, mini journals, a wallet, lip balm, pencil case for school... Found the book "Beezus and Ramona." LOVED that series as a kid, and because I was oh, so, cool, I'm sure my niece would love it 20 years later. OK, 21 years later, but who's counting? Also got them some Silly Bands. Have you seen these things? 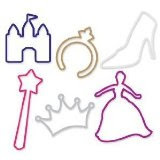 They're rubber bands that are made in different shapes and colors (princesses, animals, dinosaurs, etc). I guess they're super popular. You wear them on your wrist and trade them. Last week my younger cousins gave me a star, a pig and an LOL. Yea, I'm pretty much the coolest 30 year old cousin around. Moving on again, take 2... Got home and searched for gift wrapping. I like a gift to look nice. I DON'T however, like paying more for the wrap than I did for the gift. Thought about making a quick tote for each girl... Checked out my fabric shelf and found a couple of yards of the cute bubble fabric below. I bought it for baby burp cloths a couple years back but Joe made fun of it and said he was going to get a headache from looking at it. Whatever. 2 years later and I'm over it. Whipped up a couple of these babies. They turned out even cuter than I thought they would. Of COURSE I had to add a sweet floweret to them. I will be adding a tutorial for this bag one of these days. For anyone who wants an easy sewing project, try it out! Every family party, my sister-in-law requests the recipe below. It is DELICIOUS and is a great thing to bring if you're out of ideas or want something new to bring. Relatively easy to make (a lot of chopping, so I use my food processor). I could eat it with a spoon, but normal people use tortilla chips. Word of warning. Wash your hands really well after cutting up the jalapeno. My nostrils and lips are burning because I touched them after cutting the jalapeno up... It's been like an hour since I cut it. No, i wasn't picking my nose or anything. I had an itch. Geesh. Time to go party. Check out my party dress. $1 at Plato's Closet. Yea Yea! ready for the bag tutorial! Kindra...you sew too? We should have a sewing party sometime. =) I can't wait for the tutorial as well. Tina...you're crazy. We all know you were picking your nose. Whatever. 'Sew' cute. Love the bag and the fabric. Yes Gina, in my free time I sew...haha, not that I have free time, but I used to sew some of Else's clothes and I made crib bumpers, bed skirts and blankets for Else and Ethan when they were little. The last things I sewed were the kindergarten room chair covers at HCA and a bag for my bible study books. One day I'll get my grandmas Serger and then there will be no stopping me! 1. "Joe made fun of it and said he was going to get a headache from looking at it. Whatever. 2 years later and I'm over it." LOL at you and Joe.